Harness the power of the ultimate Smartphone for the ultimate Star Wars fans. OnePlus just announced the Limited Star Wars Edition OnePlus 5T during Comic Con event in Bengaluru, India. The Star Wars Limited Edition OnePlus 5T has while back with COOL Star Wars branding. There's a Red colored alert slider on the left. The overall package looks awesome and is perfect for Star Wars fan! 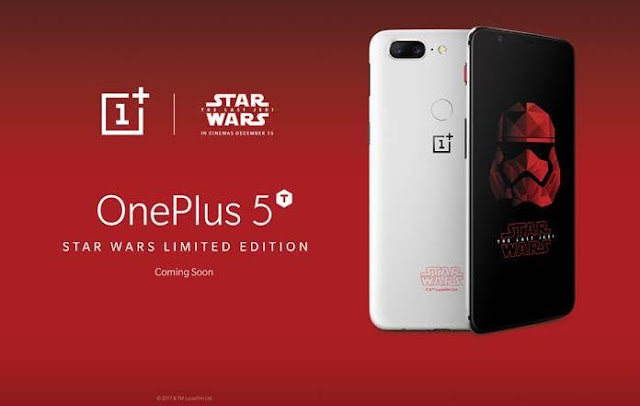 OnePlus is expected to reveal the availability and pricing of the OnePlus 5T Star Wars Limited Edition sometime next week. With the OnePlus 5T, you get a 6.01-inch FHD Optic AMOLED 18:9 display, Qualcomm Snapdragon 835 processor, 6/8GB RAM, 64GB/128GB storage, 16MP + 20MP with f/1.7 aperture for the best low-light, zoom and anti-blur photos with enhanced image processing, 16MP front camera, 3300mAh battery with Dash Charge, and Android 7.1.1 Nougat. What else new though? Well OnePlus has also added Face Unlock feature that uses 100 identifiers to make sure you are you before unlocking.